In parts one and two of this guide to collecting oddball baseball cards we provided collectors with a look at the many sets released in conjunction with food products and those issued by retail stores and businesses over the years. In this last installment, we look at another segment of oddballs that continue to give collectors a never-ending supply of ephemera to pursue. With names like Supers, Peel Off's, Stamps, Tattoos, Felts, Coins, Pin Ups, Giants, Look ‘n See, Scoop, Magic Photos and more, baseball card manufacturer Topps has experimented with all types of commodities to bolster gum and candy sales. , these cards are tough to find in any condition and command top-dollar for Hall of Fame players. Everyone should be familiar with the famous 1951 Topps Red and Blue backs, widely considered Topps' first official full baseball card set. Although 1952 Topps Baseball is considered the hobby's landmark set, Topps also made another set the same year that is often overlooked by baseball card collectors. 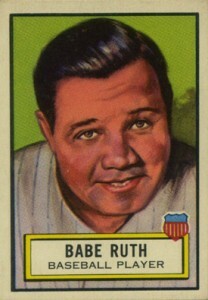 1952 Topps Look 'n See had just one baseball player--Babe Ruth. When viewed with a piece of red cellophane, which was included in the pack, a hidden image was revealed on the back of the card. 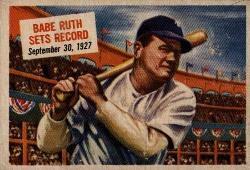 Outside of Ruth, the checklist is primarily historical figures. In 1955 Topps experimented with two additional products. 1955 Topps Doubleheaders are reminiscent of the Double Mecca Folders issue almost 50 years earlier. The ingenious cards could be folded and put together to create various stadium scenes. Requiring far less ingenuity were the 1955 Topps Stamps. Printed just like the regular 1955 Topps Baseball cards but these were on paper and contained perforated edges resembling a postage stamp. The next several years saw everything from the 1956 Topps Pins to the Felt pennants set of 1959 and more. Constantly looking for a way to get kids to fork over their hard-earned nickels and dimes, Topps' experimented with felt emblems and pennants. However, both proved too costly for their target audience and the company soon abandoned the offering. 1951 Topps Connie Mack All-Stars: One card came packaged with two Red Backs and a caramel. The set has 11 cards. 1951 Topps Major League All-Stars: Using players from the past proved unpopular with kids so Topps moved to current players, again issued with a caramel. Eleven cards make the set. 1951 Topps Teams: This short and regional test offering also included a piece of caramel. Collectors need nine cards to finish the set. 1954 Topps Scoops: A 156-card set that contained write-ups of historical events, the set did contain four baseball players with Babe Ruth and Bob Feller being the most recognizable. 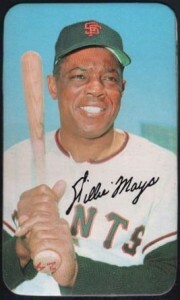 1955 and 1956 Topps Hocus Focus: Similar to the aforementioned 1949 Topps Magic Photos, this release came in two sizes. The large 1956 set has 18 subjects, while the small-sized 1955 set has 23 cards mentioned on the back but not all have been uncovered. 1956 Bazooka Felt Emblems: A premium offering on the backs of specially marked Bazooka bubble, and the set features 16 emblems. 1958 Bazooka Felt Emblems: Featuring another 16 emblems, these were produced as a means of dumping remaining inventory. 1959 Bazooka Felt Pennants: The last of the felt offerings, the set featured 16 folded team pennants measuring 5" x 15". The 1960s brought more creativity and a steady stream of experimental offerings. 1960 saw the creation of a rudimentary tattoo set of 96 subjects, including player images, logos, and facsimile signatures. The tattoos were issued on the backs of wrappers of Topps Tattoo Bubble Gum. 1961 Topps Magic Rub-Offs were inserts in first series packs of 1961 Topps Baseball. Containing 36 cards, it is highlighted by 18 baseball players with unusual nicknames and 18 team pennants. 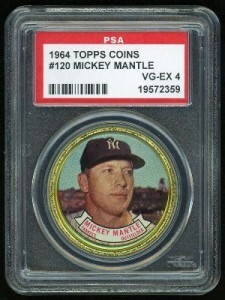 1964 Topps Coins is one of the most popular oddball sets of all-time. Featuring a set of 164 subjects, these 1 1/2" coins are very colorful and easy to find in good condition. 1961 Topps Stamps: 208 total stamps issued in 1961 Topps Baseball series two and higher. They came in blocks of two. 1962 Topps Baseball Bucks: Designed to resemble real money, the set has 96 subjects. 1963 Topps Stamps: A total of 200 stamps, these are more colorful than the first release. 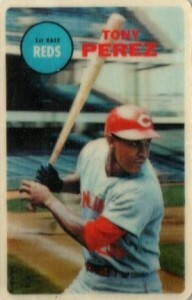 1963 Topps Peel-Offs: These 46 stickers measure 1 3/4" x 2 3/4." These unnumbered stickers have two versions: rare blank backs and variations that have peeling instructions. 1964 Topps Photo Tattoo: The 75-subject set is composed of 55 players and 20 logos. They were issued on the back of wax wrappers. 1964 Topps Stand-Ups: Of the 77 total cards, 22 were short printed. Cards have a full-length, die-cut color shot and measure 2 1/2" x 3 1/2". They were sold as a standalone product. 1965 Topps Transfers: Issued in high series packs, these 72 iron-on transfers didn't really catch on at the time. Today, they can be tough to find in good condition as a result of their lack of initial popularity. 1965 Topps Embossed: Another 72 subjects, these were inserted into low series packs and bear little resemblance to the depicted player. 1966 Topps Rub-Offs: A total of 120 subject, these can be found rather easily in good condition, although centering is an issue. 1967 Topps Pin-Ups: Measuring 5" x 7", these 32 full-color posters were highly successful. 1968 Topps Game: Another insert set, these 33 cards are slightly smaller than standard size. The checklist had enough key players to encourage collectors to the chase complete sets. 1968 Topps 3-D: One of the era's best three-dimensional printing samples, cards came two to a pack and even contained a small easel for easy display. The set has 12 cards, including Roberto Clemente which, can draw four to five figures on the secondary market. 1968 Topps Posters: With the success of the earlier release, Topps increased the size to 9 3/4" x 18 3/8" and sold them as a stand-alone product for a nickel. The idea flopped and the unsold posters wound up being used as an insert in 1970. 1969 Topps Deckle Edge: Including two variations, the 35 black and white cards are easily identifiable with their scalloped cut edge. The cards were very popular and are easily recognizable. These were originally an insert in 1969 Topps Baseball Series Three. 1969 Topps Super: Topps' first official premium release, the cards measuring 2 1/4" x 3 1/4", featured a high-gloss, thick card stock and a 66-player checklist. 1969 Topps Decals: Recreations of the original 1969 Topps cards, these were designed on transfer paper. They are very small at just 1" x 1 3/8" and are easily damaged. 1969 Topps Stamps: In their third run of the decade, this series included 240 stamps and an album for each team. Distributed as a stand-alone product, five cents got you an album and a sheet of 12 stamps. the 1970s. The decade's first premium was the re-release of Topps Supers in 1970. The checklist consisted of 42 cards that were printed on ultra-thick, very durable cardboard. The cards feature rounded corners, full-bleed photography and a size to justify the name, measuring 3 1/8" x 5 1/4". Cloth stickers, or silks, were supposedly introduced in 1970 and 1972 but few made it into the market. Official releases came in 1977 with 55 players and 18 puzzle pieces. The cloth cards seemed to unofficially end the printing experimentation phase for the company with most of the remaining oddballs from the 70s being more traditional. 1970 Topps Scratch-Offs: An insert in early series packs, the scratch-offs revealed a baseball play. Scores were meant to be kept on the back cover. Measuring 2 1/2" x 3 5/16", there are 24 in the set and can be easily found. 1970 Topps Story Booklets: An eight-page book measuring 2-1/2" x 3-1/2" was an additional insert for cards from 1970. The 24 booklets can be found for very reasonable prices today. Willie Mays and Pete Rose lead the checklist. 1970 Topps Posters: The third of three inserts from 1970, the most ever, these extremely fragile pieces measured 8 11/16" x 9 5/8" and are easily found today. 1970 Topps Candy Lids: The 1-7/8" round lids feature player photo. The lids were a test issue of 24 players. 1971 Topps Super, Scratch-Offs, Tattoos, and Coins: Sticking with what worked, the company's test marketing of the previous decade made for easy decisions to revisit these concepts. 1971 Topps Greatest Moments: An often overlooked set of 55 cards that measure 4 5/8" x 2 1/2", they were printed in a horizontal format with black borders. Each has two photographs on the front, chronicling the game. 1973 Topps Action Emblems: The emblems are new team logos created by Topps for the league's teams. This is a very, very odd set that is difficult to find today. 1974 Topps Stamps, Team Checklists, Deckle Edge, and Puzzle: These sets began to wind down the company's saturation of inserts, tests and supplemental issues for the decade. However, the boom market of the early 80s and new competition meant Topps was back at the drawing board looking for the next big insert. 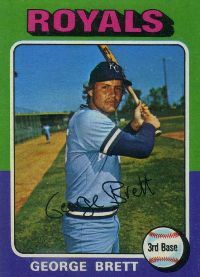 1975 Topps Mini: One of the most popular sets off all-time, this is the first complete parallel set. It was produced in a reduced size format. Collectors still chase them today. When Topps lost their exclusive baseball card license in the early 1980s, it wasn't long before the market became flooded with new products from Topps' chief competitors, Donruss and Fleer. Each of the companies was looking for an edge to entice people to buy their cards. A flood of tried and true inserts and new concepts developed in the early part of that decade and included the popular “Tiffany" sets. These limited edition versions were released exclusively to dealers as factory sets. They are identical to the regular cards, but were printed in Ireland using white cardstock and a glossy finish on the front. There are almost too many of these oddballs from the 80s to list, but a few of the most popular are listed below. By this time, Topps really began focusing their efforts on joint licensing and co-branded manufacturing as detailed in parts one and two. At this point, oddball sets morphed into something slightly more mainstream with their presence in multiple distribution channels. In addition to Topps, there are other manufacturers that produced oddball sets. One of the most significant of these is the Fleer Laughlins of the early 1970s. A whimsical series of cards chronicling World Series history with cartoon images and bright, vibrant colors, these sets are extremely popular with collectors even today and can be a tough chase, especially in mint condition. The 2011 Standard Catalog Of Baseball Cards by Bob Lemke is a great resource to find checklists on these and other Topps premium issues and inserts. We know we didn't include every set here. In the interest of space, we stuck with the ones that remain the most popular. If you have a favorite set, question or additional set we didn't mention, drop a note in the comments section below. These are cartoon sets of Hall of Famers. Each set comes with 10 cards and I have set 1 and 2 of 4 set total. Anyway any info you know about these cards? I am trying to find information on the 1992 kraft 3 – d baseball cards. Any help would be greatly appreciated.